Sodicity is a measure of the exchangeable sodium in relation to other exchangeable cations in soil and is expressed as the Exchangeable Sodium Percentage (ESP). A soil with an ESP greater than 6 is generally regarded as being a sodic soil in Australia (Northcote and Skene, 1972). An ESP of six has been considered to be the lower limit of the amount of sodium required to produce a detrimental effect on the growth of most crop plants (Northcote and Skene, 1972). Other problems which can arise when the ESP is six or higher equate to the loss of soil structure by spontaneous clay dispersion, and very low rates of hydraulic conductivity (Loveday and Pyle, 1973). Dispersion describes the behaviour of clay particles separating from one other in a moist soil. Dispersion can cause soil aggregates to break down and the dispersed clay to clog soil pores. Structural decline and erosion usually result. Most sodic subsoils are dense and coarsely structured which results in significant restrictions to effective rooting depth. Rengasamy and Churchman (1999) summarised the physical manifestations of soil sodicity as crusting, hard-setting and waterlogging of soils and the range of side effects in terms of water movement into the soil profile included reduced infiltration and plant-available water capacity, whilst reduced leaching caused perched water tables, an accumulation of toxic elements as well as increased fuel consumption during tillage, with implications for increased management costs. The impact on plants was apparent by poor seedling emergence, aeration and root development. From an environmental viewpoint, sodic soils have been often associated with tunnel and gully erosion in Victoria. 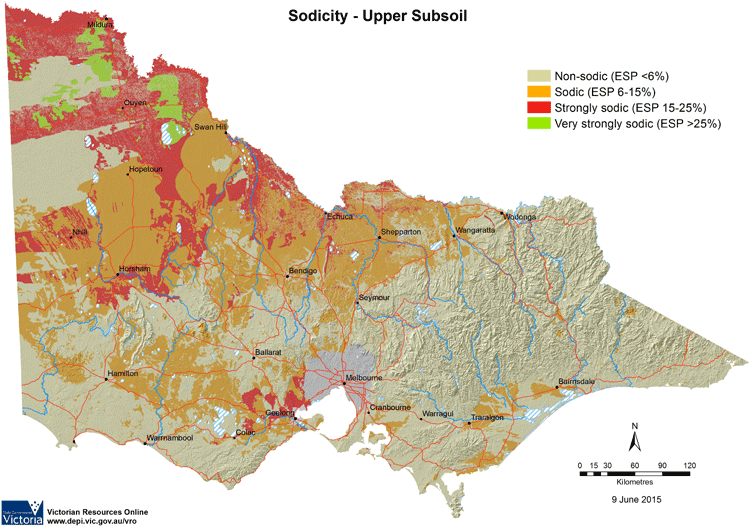 This new map provides a broad statewide overview of upper subsoil sodicity levels across Victoria. It has been created from soil data observations within the Victorian Soil Information System (VSIS) and developed as part of the DEDJTR Systems for Enhanced Farm Services (SEFS) program in June 2014. Mapping is based on best-available current data and will be further developed as new data becomes available. The data used to produce the map has been derived from previous soil and land surveys conducted over the past 50 years and the intensity of source data used varies considerably across the state. It should be noted that the map should not be used to indicate subsoil sodicity at the local scale, but instead as a generalised indication of likely ESP classes at regional to statewide scale. Considerable variation in sodicity is likely within a region, depending on factors such as soil type, landform, climate and landscape process. There is generally a significant relationship between rainfall and sodicity, with lower levels of ESP more likely to occur in higher rainfall zones. More detailed information on Sodic Soils on the VRO website.